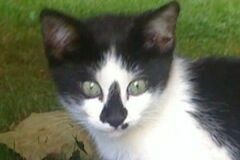 Found Ms Kitty when she was just a baby around 4th of July. She was wild and had been born in the wild. After several attempts of trying to pet her, I finally got her to trust me. Now she knows my voice and comes running. She is so affectionate and loving. Ms Kitty is so attached now. All she wants is to be held so she can sleep on my shoulder like a baby. She is the most loving cat I have ever been around. I love her so much. Miss Kitty is cute as can be! I'm so glad you have begun to win her over. I hope you will eventually be able to get her to accept you totally and let you take her home with you. Then she will really live the good life because you are obviously a very loving person. Thanks for telling us about Miss Kitty. Ms Kitty is so cute and sweet. I'm so happy that you were able to get her to trust you. Cats born in the wild (also known as feral cats) are so hard to domesticate. They need lots of patience but it's worth it. Thank you for sharing!